We re-registered the FRx program dll’s by running the following (double-click to start) “FRxReg.exe” and “FRxReg67.cmd”. 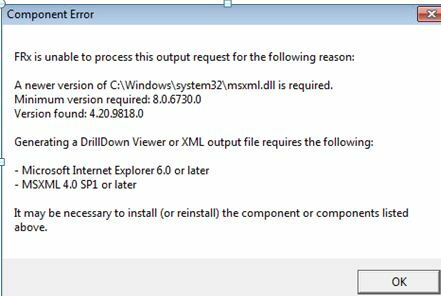 Once we installed the attached dll and registered it, we ran “FRxReg.exe” and “FRxReg67.cmd” from the FRx directory (C:\Program Files\FRx Software\FRx 6.7\) and the FRx drill-down viewer file worked again even though the screenshot calls for a minimum version of 8.0.6730.0 and the attached msxml.dll version is only 8.0.5226.0. I so thank you for these procedures. I had a customer with FRx 6.7.8 sp 11 and was getting all these errors. I worked for over 8 hours uninstalling and reinstalling with no results. the msxml.dll would not register on windows 7 64. I finally ran the frxreg.exe and the frxreg64.exe and I think that did it. Thank God for the internet and for users who post their issues and the resolutions.